The touring multimedia exhibition “Municipality builts – Vienna Housing from 1920 to 2020” will show visitors the history of municipal housing in Vienna and its significance for the people of Vienna and society overall – from the early days of Social Democrat-governed “Red Vienna” in the 1920s until today and beyond. The exhibition shows how the requirements for social housing policy have changed over time due to changes in society, technological advances in construction, and transformations in urban planning and architecture. The main focus is on the people and their changing housing needs over time. Vienna’s municipal housing is known in Europe as an outstanding example of successful social housing policy and has a history that reaches back nearly a century. Today around sixty percent of the city’s inhabitants live in a subsidised apartment – either in one of the 220,000 municipal apartments or in one of the 200,000 apartments built with subsidies from the state of Vienna. Half a million city residents live in the approximately 2000 municipal housing blocks alone. In the 2013 Viennese referendum, over eighty seven percent of the population voted in favour of protecting communal services – including residential facilities – against privatisation. “No other city in Europe has demonstrated such continuity in its social housing policy and remained dedicated to this in the face of the neoliberalism and privatisation zeitgeist. The city has committed itself to municipal housing and, in contrast with many other cities, at no point considered selling this communal property as such a move would massively encourage speculation in the housing market and an increase in rental prices. Although over the decades many new approaches have been developed and realised, the fundamental principles of “Red Vienna of the First Republic” remain today. Alongside a high standard of living, these principles include social cohesion and a balanced social mix. Since then the maxim of the social housing policy of Vienna has been to flexibly respond to the housing needs of the people and to implement housing in touch with the wishes of the population. As one response to the growing need for high quality, compact and very affordable housing, the city has introduced the SMART housing programme,” explains Councillor of Housing, Michael Ludwig. The first 2000 SMART housing units should be ready for occupancy by the end of 2015. Visual materials of the exhibition are available from Beate Engelhorn: be@aedes-arc.de. The American Society of Landscape Architects has launched a new Career Discovery web site to help young people explore the profession of landscape architecture. To help teachers steer young people towards the field, a new resource center has also been created, filled with classroom activities. The Career Discovery website, aimed at students in middle school and high school, explains what a landscape architect does and how to become one. With a background that features the evolution of Columbus Circle in New York City from sketch to reality, the website shows how landscape architects creatively solve complex urban and environmental issues through design. 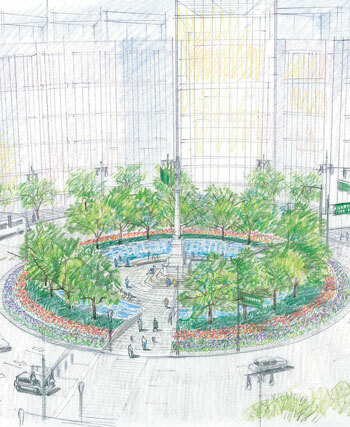 Columbus Circle was redesigned by OLIN, a landscape architecture firm, and received a 2006 ASLA Honor Award in the General Design category.